Get ready for more Google+ data in your Google searches as the company aims to personalize your results by including more Google+ profiles, business pages, posts, and Google+ and Picasa Photos. The search giant recently announced the significant change to its search engine, calling it Search plus Your World. The new feature is baked right into Google and aims to personalize your search results by including Google+ data when you are signed into your Google account. Search plus Your World surfaces content that has been shared with you on Google+, as well as public information from the social networking site that is related to your search, and integrates this data into typical Web search results. The new opt-out feature is currently rolling out over the next few days to all users searching Google in English. There are three types of Google+ data that will start showing up in the new Search plus Your World results: personal results, profiles in search, and profiles and pages. Personal results include data from your own Google+ photos and posts, as well as Google+ data that has been shared with you. These results may include non-public Google+ photos and posts that were shared with you or posts you shared with a select group of people. Say, for example, you do a search for Tahiti in anticipation of a vacation you're taking on the French Polynesian island. Photos of Tahiti posted by anyone in your Google+ circles could appear in your results. Since some of this data may not be publicly available, only you will be able to see these posts in your search results. Your private Google+ photos and posts will not start showing up in a stranger's search results, Google said in a blog post announcing the change. 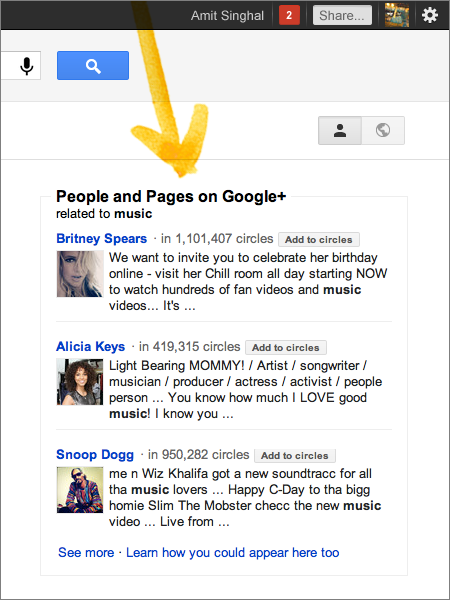 Profiles in search will be just what it sounds like: more Google+ profiles appearing in your search results. Google+ profiles have been appearing in search for some time, and Google has been featuring links to Google+ profiles of journalists, authors and other writers in its results for some time. But now if you type in the name of someone you're connected to on Google+, such as your friend Sam Clarke, his name will start appearing as an autocomplete suggestion as you type. The new profile results will also include Google+ profiles of famous people such as authors, musicians, and actors. People and pages results are simply results from Google+ business pages and notable Google+ users. Say, for example, you search for a generic topic in Google such as "music." 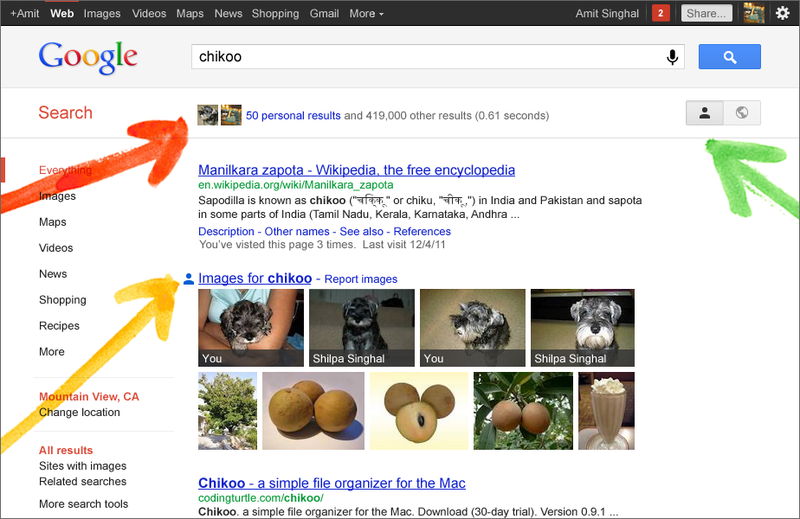 You may then see results in the right-hand column of the search results page with links to people on Google+. In the "music" search, for example, Google says you might see links to the Google+ profiles of people such as Britney Spears, Alicia Keys and Snoop Dogg. Twitter freaks out; will Washington be far behind? Google's new search feature is raising some concerns about Google prioritizing its own content instead of linking out to third-party sites, which arguably is the whole point of a search engine. Twitter, for example, is raising concerns that it will be harder to use Google to find timely Twitter posts about breaking news such as tweets from protesters in countries like Egypt and Syria. The problem with Twitter's argument, however, is that the micro-blog chose not to renew its search results agreement with Google in July, according to Google. As a result, a lot of Twitter data is now effectively walled off from Google. Facebook has not commented on Search plus Your World, but content on the world's largest social network is also something Google is not allowed to index. But considering Facebook's recent privacy deal with the FTC, it would end up in real trouble if the company let Google index Facebook data that users believed was going to remain private. Regardless, if other social networks won't let Google access their data, why shouldn't the search giant personalize your Google search results with your own information from Google+? Perhaps a bigger issue than any potential sniping from other social networks is that, as bloggers such as MG Siegler and Search Engine Land's Danny Sullivan have mentioned, Google may get into antitrust trouble over Search plus Your World. Google is effectively using its popularity as a search engine provider to promote its social network by prioritizing Google+ data. Bundling one smaller service on the back of another much bigger one is what sparked Microsoft's trouble with antitrust regulators through the late 1990s and early 2000s when it included Internet Explorer with Windows. With all the current antitrust interest in Google from lawmakers and regulators, deliberately prioritizing links to Google+ in search results may not be the best idea. If you hate the idea of having Google+ data messing up your search results you can turn it off by adjusting your search settings once the new feature rolls out to your account.